In July there was a surge of excitement that the Higgs boson was about to be revealed. But now, just a few short months later, it seems that the press are ready to give up on the search. "Higgs boson range narrows..." says the BBC, "'God particle' goes missing..." says the Daily Mail, "Higgs boson may be a mirage..." says Reuters. But are they right to be disheartened? We asked Professor Ben Allanach, a particle physicist at the University of Cambridge, to explain exactly what they are, or aren't, finding at the LHC. As Allanach explained in his article, Particle hunting at the LHC, the Higgs boson is one of the most important discoveries they hope to make at the Large Hadron Collider (LHC). But finding the Higgs isn't a matter of directly catching the beast itself. 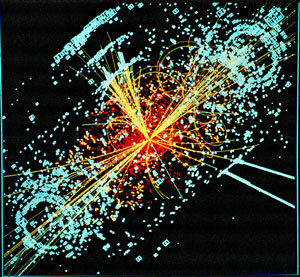 "The Higgs leaves its signature in the properties of the particles it decays into," says Allanach. "If a Higgs boson is produced during a collision at the LHC it will quickly decay into other particles and exactly what these particles could be and how they behave will depend on the mass of the Higgs itself." The mass of the Higgs (measured in gigaelectronvolts, GeV, of energy thanks to e=mc2) will be converted into the mass and kinetic energy of the resulting particles and the fleeting presence of the Higgs will be revealed by measuring the properties and behaviour of these footprints. But how will the physicists know that the footprints left after a collision, say, a pair of photons or a pair of W bosons whizzing off at a particular speed, belong to the Higgs and not to some other exotic particles that has been produced and then decayed? It would be impossible to know this after an individual collision, but thanks to the fantastic predictive power of the Standard Model and a simple statistical model, it is possible to tell the footprints apart if you have enough collisions. When the beams of protons collide in the LHC, detectors measure the energy, momentum and direction of the particles produced. The results are plotted in histograms counting how many collisions produced certain footprints, say pairs of photons with given energies as shown in the histogram on the left. The evidence for the Standard Model is such that physicists can predict the shape of these histograms extremely accurately for all the collisions that do not involve the Higgs boson (as indicated by the dotted line in the histogram). Then if there is any deviation from this shape, a bump or spike in the graph, this would indicate that more particles (photons in this case) with a particularly energy had been produced than can be accounted for by all these other background processes. Such an excess is explained by a Higgs boson being produced and then decaying and this is the evidence the physicists are looking for. Some statistically small bumps were reported back in July but as the LHC has generated more and more collisions these bumps have since disappeared. Bumps appearing and then flattening out isn't really surprising in this sort of data. Suppose I ask you to roll a die and your first 10 rolls are all sixes — you might suspect that the die is loaded. But as you carry on to throw more rolls things start to even out and you decide the die is fair after all. When you are looking at series of independent events, such as dice rolls or proton collisions in the LHC, rare things do happen — you could get a lucky streak of 10 sixes. But if the die is fair and you roll it for long enough the data will smooth out into the predicted shape. Lucky streak or loaded dice? 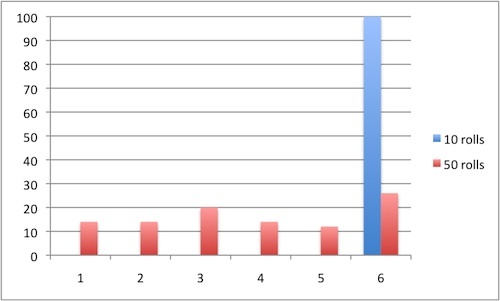 Rolling sixes for the first 10 rolls (100% of the rolls shown in the blue histogram) might worry you that the die is loaded, but carrying on to roll it 50 times in total (the red historgram shows the percentage of the rolls for each face) reveals it really is fair. The excitement about the LHC data now concerns the narrowing range of possible masses for the Higgs boson. Measurements taken at the preceding collider at CERN, the Large Electron-Positron Collider (LEP), ruled out a mass of less than 115 GeV and larger than 180 GeV. The LHC has already narrowed the remaining gap and the physicists are now focussing on the range from 115GeV to 140GeV. By the end of 2011 the LHC should have produced enough collisions to examine the remaining range, says Allanach. Obviously there'll be tremendous excitement if they find the tell-tale bump of the Higgs... but what if they don't? "Physicists are very confident that the Higgs is there," says Allanach. And if they don't see the footprint of the Higgs in the data gathered by the end of this year it won't be definitive proof that the Higgs doesn't exist. It will instead mean they are 95% confident that it doesn't exist, which in physics isn't actually that convincing. 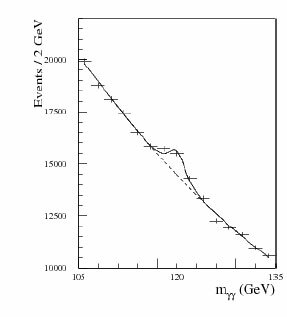 There is still a 1 in 20 chance that it does exist and they have hit an unlucky streak (similar to our run of 10 sixes above) and with enough collisions the Higgs might be seen. This level of confidence is called the two-sigma level in particle physics; that is the data is within two standard deviations of the mean (you can read an excellent explanation of this at The Conversation). A two-sigma result is only taken as an indication of a result. The particle physics community won't be satisfied they even have evidence for the existence, or non-existence, of the Higgs until they have enough data to say they have a three-sigma level result. And even then they will still carry on carefully counting the footprints from LHC collisions; it will only be when they have a five-sigma level result that they would say they have made a discovery. And at that point, it will definitely be time to open the champagne.